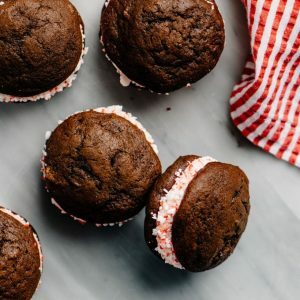 This recipe for peppermint whoopie pies is largely based off Mark Bittman's classic recipe in How to Bake Everything. My version is infused with peppermint flavor throughout, and I baked them a bit smaller for the perfect two-bite cookie experience. Position a rack in the center of the oven, then heat the oven to 375°F. Line two baking sheets with parchment paper, then grease with softened butter or spray with cooking spray. Sift the flour, cocoa powder, baking soda, and salt. Whisk until combined. Combine the butter, light brown sugar, and granulated sugar in the bowl of a stand mixer fitted with the paddle attachment. Cream the butter and sugars at medium high speed until light in color and fluffy, 3-4 minutes. Add the peppermint extract, and mix at medium speed until just barely combined. Add the egg, and mix at medium speed until just barely combined. Add half the dry ingredients, then mix on low until just barely combined. Add the buttermilk, and again mix on low until just barely combined. Finally, add the remaining dry ingredients and combine by hand with a rubber spatula. The dough will be sticky, with the consistency of thick cake batter. Using a small cookie scoop sprayed with non-stick cooking spray, drop 2-teaspoon mounds of dough onto a prepared baking sheet, leaving 2 inches between cookies. You should be able to fit 12 cookies on a sheet. Transfer the baking sheets to the oven and bake until the tops of the cookies lightly spring back when pressed gently, 10-12 minutes. Remove the pan from the oven, cool the cookies on the sheet for 5 minutes, then transfer to a wire rack to finish cooling. Repeat with the remaining dough. Make the frosting. Combine the butter and peppermint extract in a stand mixer. Using the paddle attachment, beat at medium high speed until soft and airy. Add the powdered sugar, about a cup at time, and mix on low speed. Allow the first portion to incorporate completely before adding the next, and scrape down the sides in between additions. Add the cream, starting with 2 tablespoons, and mix into the frosting at medium speed. Increase the speed to medium high and beat until the frosting is smooth, creamy, light and airy - about 2 minutes. Taste for texture. Add more cream, a tablespoon at a time, if the frosting is too thick. Add more powdered sugar, a tablespoon at a time, if it's too thin. Transfer the frosting to a piping bag. Place 4 broken candy canes (or a handful of unwrapped peppermint candies) into a food processor. Pulse until the candies are crushed, but not pulverized. Pipe frosting onto a a completely cooled cookie, then top with a second cookie. Sprinkle the exposed frosting with crushed candies, or roll the cookie into a dish layered with crushed peppermint. The formed cookies are best served immediately, but can be kept in an airtight container for up to 24 hours if necessary. The baked, unfrosted cookies can be stored for up to three days in an airtight container.